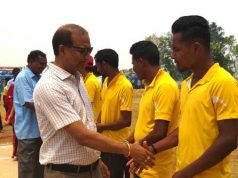 Bhubaneswar: Mr. Aditya Padhi, Chief Secretary, Odisha, inaugurated the 12th edition of Tata Steel Friendship Cup Football Tournament organised on September 8, 2018 at Kalinga Stadium. Present on the occasion were Mr. Chandra Sarathi Behera, Sports and IT Minister, Government of Odisha, Mr. Ramesh Chandra Majhi, Minister, ST and SC Development, Government of Odisha, Mr. Niranjan Pujari, Minister, Housing & Urban Development and Water Resources, Govt of Odisha, senior bureaucrats, journalists along with Mr. Arun Misra, Chairman, Tata Steel SEZ. The first semi-final of the tournament was played between the Leaders XI and Bureaucrat XI. In the first half of the match, Mr. Balwant Singh from Bureaucrat XI scored two consecutive goals to take his team on a significant lead. In the second half, Mr. K. Pradip of Bureaucrat XI scored two more goals. Bureaucrat XI won the match 4-0. The second semi-final of the tournament was played between Tata Steel XI and Media XI. In the first half of the match, Mr. Digza Prasad scored the first goal of the match and gave Tata Steel XI an advantageous position in the match. In the second half, Mr. Bikash Marandi of Media XI scored an equalizer against Tata Steel XI and brought the score down to 1-1. The outcome of the match was decided by penalty shootout in which Tata Steel XI won by scoring 5-4 against Media XI. The final match was played between Tata Steel XI and Bureaucrat XI. It was a hard fought match in which both the teams failed to score any goal in the first half. In the second half, Mr. S. D. Durga of Bureaucrat XI scored one goal and sealed the game for his team. 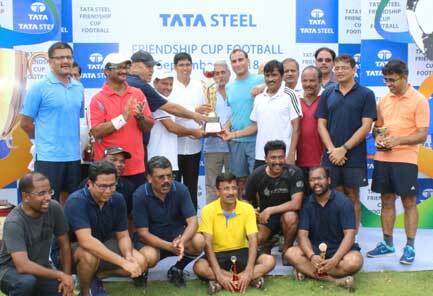 Bureaucrat XI became the champions of the 12th edition of the Tata Steel Friendship Cup Football Tournament. Mr. Arun Sahu, MLA, Nayagarh, Mr. Suresh Mohapatra, IAS, Additional Chief Secretary, Forest & Environment Dept, Govt. of Odisha, Mr. S. P. Thakur, IAS, Chief Administrator, KBK, Mr. Dillip Satapathy, Resident Editor, Business Standard, Mr. K. Ravi, Bureau Chief, The Statesman, Mr. Srimoy Kar, Senior Journalist, Mr. Dilip Bisoi, Editor, MBC TV, Mr. Tapan Mishra, Senior Journalist, Samaja, Mr. Arun Misra, Chairman, Tata Steel SEZ, distributed prizes to both the champion and runners up teams. 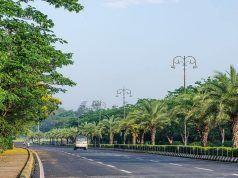 Mr. K. Pradeep of Bureaucrat XI was awarded Man of the Match for the first Semi-final, Mr. Rakesh Bharadwaj of Tata Steel XI was awarded Man of the Match for the second semi-final and Mr. Digza Prasad of Tata Steel XI was awarded Man of the Match for the finals. Mr. Rajiv Seth of Tata Steel XI was awarded the Best Goalkeeper. Mr. Saswat Mishra of Bureaucrat XI got the award for the Best Defense. Mr. Bikash Marandi of Media XI was awarded the Best Forward. Mr. Arun Sahu of Leaders XI won the Fair Player Award of the tournament. Mr. Suresh Mohapatra of Bureaucrat XI was awarded the Best Half Award. Mr. Balwant Singh of Bureaucrat XI was awarded Highest Scorer of the tournament. The Best Disciplined Team Award went to Bureaucrat XI.